A special service to celebrate the forthcoming diocese Pilgrimage to Lourdes has taken place at St Chad’s Cathedral. Hundreds of people representing the various groups which are travelling to Lourdes attended today’s Blessing of Hands event, on the feast of Pentecost (Sunday). It was very moving to see people of all ages go up to the altar steps to have their hands blessed for whatever ministry they may be involved in. More than 800 people are travelling to Lourdes this year, led by His Grace, Archbishop Bernard Longley. The pilgrimage will leave on Saturday 26 May and return on Saturday 1 June. It’s theme this year is ‘Do whatever He tells you’. Today’s Mass was celebrated by Mgr Timothy Menezes with support from several other clergy, including Canon Gerry Breen, Pilgrimage Director. Musical accompaniment was provided by Jo Boyce, director of CJM Music, and fellow musicians. During his address Mgr Menezes encouraged everyone to ‘enter into the love and trust of the Holy Trinity’. During the pilgrimage we are aiming to regularly update our website with photographs from Lourdes, thanks to members of the Kenelm Youth Trust team. 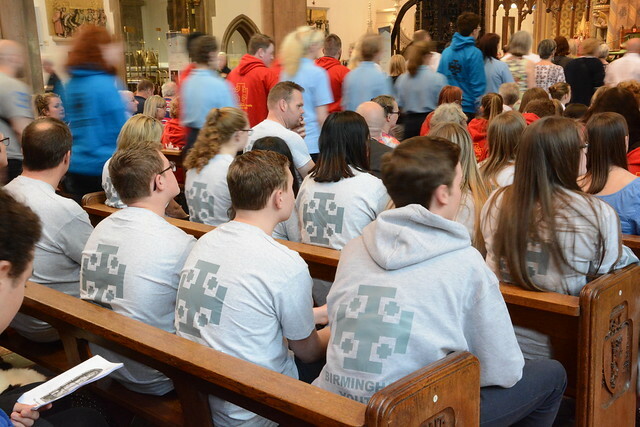 More than half of the Pilgrimage is made up of children and young people from schools, parishes and youth groups, and it is one of the biggest gatherings of young people in the Archdiocese. Lucy Palmer, aged 20, is a volunteer with the Kenelm Youth Trust. This will be her sixth visit to Lourdes. penance, the Eucharist and life in the Church. myself through you to your Son, Jesus. of the Blessed Virgin Mary, Mother of God.